Residents know that most of our precipitation occurs during winter months. Records with Environment Canada indicate that, on average, our area receives only about 100 mm of precipitation during June, July and August combined. (This is less precipitation than areas of the Okanagan Valley during the same time period!) Summer is also the time when demand for water resources is highest. Consumption can increase by more than 50 % over winter use. Most of this is used to 'inefficiently' water lawns and gardens. How Can I Reduce Outdoor Consumption? Ensure that your Irrigation System is working efficiently. Follow the RDN's Watering Schedule. Follow our Outdoor watersmart tips for lawns, trees & shrubs, and vegetable garden, below. Rainwater is at a more ambient temperature for your plants & it's free! Deep but infrequent watering maintains a healthy root system. Inspect your system frequently to make sure there are no leaks. Let your lawn go 'dormant' or golden is the summertime. It will go green again with the Fall rains. Reduce your turf area if you can - consider planting native species to 're-wild' your landscape. To reduce losses due to evaporation, water early in the morning. Consider installing water efficient irrigation such as bubbler or drip systems that deliver water right at the base of the plant. Mulch around plants with straw, leaves, or live groundcover to conserve soil moisture and moderate soil temperature. Increase water retention of your soil by adding compost - this will improve soil structure and support healthy microbes. Prevent flower pots & hanging baskets from drying out by adding a perforated plastic liner. Excessive watering leaches nutrients out of the soil, encourages diseases and reduces flavor; consider a drip irrigation system. When planting water loving plants such as tomatoes, line the soil with a thick layer of newspaper to maximize water retention. Practice companion planting by placing plants with similar water requirements close together. What about Residential Irrigation Systems? Up to 65 % of water used to irrigate our lawns and gardens is lost to inefficient watering practices which result in runoff, evaporation, or leaks. Irrigation Industry of British Columbia - An excellent resource for irrigation system installation, maintenance and more. Xeriscape gardening is a systematic concept of saving water in landscaped areas - this means using fewer resources while still having a beautiful landscape. 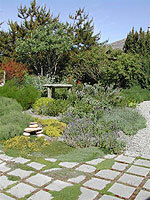 Practicing xeriscape can reduce water use by 70% or more. You can visit the RDN's Xeriscape Garden at 846 Yambury Road, Qualicum Beach. Plan and Design… for water conservation and beauty from the start. Create Practical Turf Areas… of manageable sizes, shapes, and appropriate grasses. Use Appropriate Plants... native plants and those with low water needs will allow maximum water conservation. Soil Improvement… your landscape will benefit from the addition of sphagnum peat moss, compost, aged manure, or other decomposed organic materials. Use of Mulches… these cool soil, minimize evaporation, reduce weed growth, slow erosion, and provide landscape interest. Water Wisely… consider the efficiency of your system, when you water, and how frequently. Good Maintenance… keeping your watering system free of leaks, mowing, weeding, pruning, and fertilizing on a regular basis. Wash your car using a bucket of water, sponge, and a hose fit with a shutoff nozzle. Use a broom instead of water to remove debris from paved surfaces. Cover swimming pools when they are not in use to reduce evaporation, consider a water-saving pool filter. Native Plant Society of British Columbia - Information on Native Plants of BC. VanDusen Botanical Garden - Information on water conservation, native plants, and waterwise gardening.